To celebrate the pride that solar installers and developers feel in a job well done, Ecolibrium Solar launches its #EcoSolarSelfie Solar Proud campaign. 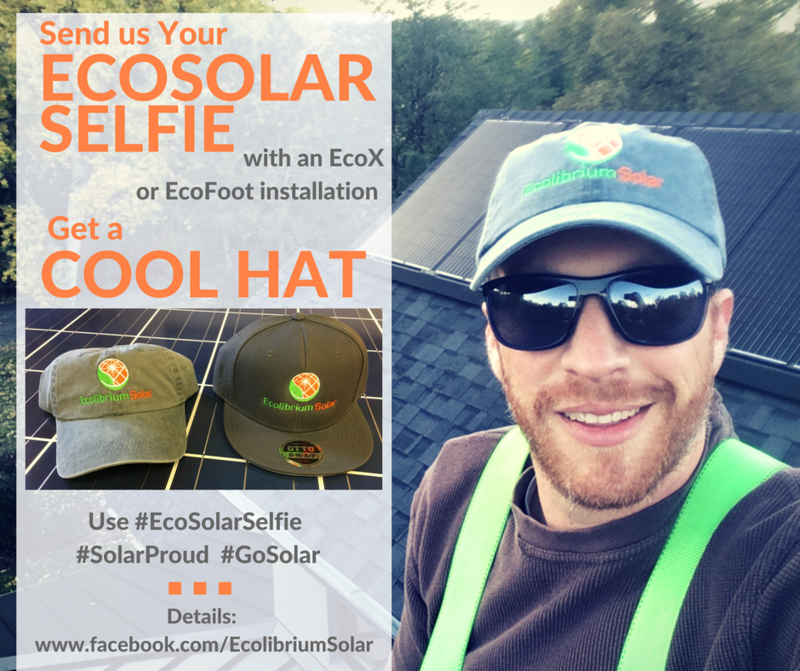 You, as an installer, developer and installation owner, send in a selfie in front of your EcoX or EcoFoot installation -- an EcoSolar Selfie. Ecolibrium Solar shares it with the world. You get a cool hat. “In the solar industry, installers and developers are proud of their work. We’re proud to be a part of that. We’re proud to be there every step of the way, providing simple to use racking, designed with the installer in mind,” says Ecolibrium Solar’s Product Solutions Manager Jonah Coles. The company is encouraging their customers and installers to send in their #EcoSolarSelfie. 2- Send it to Ecolibrium Solar via email or social media. For Facebook and LinkedIn, like the EcoSolar Selfie post and post your selfie in the comments. 3- Pass it on to your friends and colleagues in solar. After your EcoSolar Selfie is received, the company will send an email to find out if you want a curved-bill or bro-bill hat and where to send it. “Together, we're covering the world with beautiful, streamlined solar. It's time to show the pride felt in a job well done. It's time to show we are all Solar Proud,” says Coles. Please note: Your participation serves as permission to publish the photo and post you submit, along with information contained in that post. It may be published on the company’s website, social media channels, press releases and other marketing materials. All photos may not be published. The offer of a free hat is good while free hats are available. No substitutions or cash redemptions allowed except by Ecolibrium Solar. Visit Ecolibrium Solar on Facebook, LinkedIn, Twitter or Instagram or contact us at sales at ecolibriumsolar.com. ELIGIBILITY: Open to all individuals 18 or older at the time of entry. The selfie must be sent to Ecolibrium Solar via email or social media in a way that notifies Ecolibrium Solar of its existence. -For Facebook and LinkedIn, like the EcoSolar Selfie post and post your selfie in the comments. REDEMPTION: Free hats are available as long as supplies last. No substitutions or cash redemptions allowed except by Ecolibrium Solar. Redemption of the free hat is dependent upon submitting a qualifying post and responding to Ecolibrium Solar’s request for a viable shipping address. Only one hat per submission. If more than one individuals are in the selfie, Ecolibrium Solar can decide to send a hat to every person in the photo, but is not required to send a hat to every person in the photo. CONDITIONS OF PARTICIPATION: By participating in the EcoSolar Selfie Campaign, each winner agrees to indemnify, release and hold harmless Sponsor (Ecolibrium Solar, Inc.) and any respective parent companies, subsidiaries, affiliates, related companies, advertising and promotion agencies, and prize providers, and each of their respective officers, directors, employees and agents from any and all claims, actions, liability, loss or damage of any kind whatsoever, in whole or in part, directly or indirectly, in any way arising out of or in connection with their participation in this EcoSolar Selfie Campaign, in any EcoSolar Selfie Campaign or prize related activity or with respect to awarding, receipt, possession, use and/or misuse of any prize. Sponsor is not responsible for any printing, typographical, mechanical or other error in the printing of the offer, the Official Rules, administration of the EcoSolar Selfie Campaign, in the announcement of the prizes or otherwise in any materials available at www.EcolibriumSolar.com, www.facebook.com/EcolibriumSolar, https://www.linkedin.com/company/2372079/, http://twitter.com/EcolibriumSolar, www.instagram.com/ecolibriumsolar/. participation serves as permission to publish the photo and post submitted, along with information contained in that post. It may be published on the company’s website, social media channels, press releases and other marketing materials. All photos may not be published. Sponsor is not responsible for electronic transmission errors of any kind resulting in omission, interruption, deletion, defect, delay in operations or transmission, theft or destruction or unauthorized access to or alterations of entry materials, or for technical, network, internet, telephone equipment, electronic, computer, hardware or software malfunctions or limitations of any kind, or inaccurate transmissions of or failure to receive entry information by Sponsor on account of technical problems or traffic congestion via mobile phone or otherwise. The Sponsor is not responsible for any problems or technical malfunction of any telephone or network lines, computer online systems, servers, or providers, computer equipment, software, failure of any e-mail or entry to be received on account of technical problems or traffic congestion on the Internet or at any web site, any combination thereof, or otherwise, including any injury or damage to entrant’s or any other person’s computer related to or resulting from participation or downloading any materials in connection with the EcoSolar Selfie Campaign. If for any reason the EcoSolar Selfie Campaign is not capable of running as planned, including infection by computer virus, bugs, tampering, unauthorized intervention, fraud, technical failures, human error or any other causes beyond the control of Sponsor which corrupt or otherwise affect the administration, security, fairness, integrity, or proper conduct of this EcoSolar Selfie Campaign, Sponsor reserves the right at its sole discretion to cancel, terminate, modify or suspend the EcoSolar Selfie Campaign or any portion thereof without further obligation or advance notice. Sponsor reserves the right, but does not have any obligation, to select winners from eligible entries received as of the termination date of the EcoSolar Selfie Campaign. Sponsor further reserves the right to disqualify any individual who tampers with the entry process. By entering, entrants agree to comply with these Official Rules. In the event of a dispute as to who submitted an entry, the entry will be deemed submitted by the authorized account holder of the Facebook, LinkedIn, Twitter or Instagram account submitted at the time of entry. “Authorized account holder” means the natural person who is in control of the email address associated with the entering account. If a dispute cannot be resolved, the entry will be deemed ineligible.